Combining active sport and refined style, the WAF1450.BB0814 TAG Heuer Aquaracer Quartz Women’s Watch exudes elegance and durability both in and out of the water. Suitable for the office or diving for treasure, this watch is a treasure itself. This stunning timepiece features diamond-set hands with polished facets and a luminescent coating to enhance legibility. The radiant dial of the WAF1450.BB0814 TAG Heuer Aquaracer Quartz Women’s Watch is studded with diamond indexes and the 18K solid gold unidirectional turning bezel is set with 35 Top Wesselton diamonds. The date is positioned at 3 o’clock. 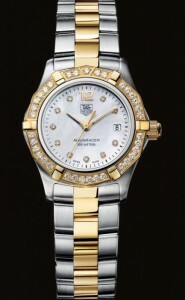 This classy WAF1450.BB0814 TAG Heuer Aquaracer Quartz Women’s Watch features a scratch-resistant sapphire crystal and quartz movement. The triple-row bracelet is fashioned from 18K polished gold plate and satin steel, and is doubly secured with a solid steel folding blade clasp. The contrast of the bracelet’s gold plate and satin steel embodies a sophisticated yet playful visage to suit the nature of the woman who wears it; tasteful, feminine, and fun. Water-resistant to 300 meters, the WAF1450.BB0814 TAG Heuer Aquaracer Quartz Women’s Watch is an exquisite example of function and fashion. Suitable for virtually any occasion, this beautiful and versatile sports watch, complete with a diving bell decoration stamped on the case back, is a testament to the distinguished TAG Heuer brand. Fantastic piece – well constructed and exquisitely phrased. I really enjoyed learning about this watch.